If you are taking the time to discover dumpster rentals in Chicago, you are probably wondering how long it will take to locate the right container. Look no further. You have found what you are looking for at Discount Dumpster. We have the best rates for our customers in Chicago, and our rental agreement is clear and straightforward. We will save you time and money while giving you a great customer service experience in the process. Our company’s goal is to take the razzle and dazzle out of the hassle of dumpster rental. 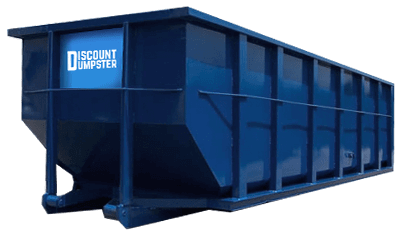 When you choose Discount Dumpster, you can save up to $100 on your next dumpster rental. Our pricing is the lowest available in the greater Chicago area. Heavy debris dumpsters are available, but we ask that no hazardous materials be disposed of in the bins. In order to reach the needs of the community, we deliver to both commercial and residential sites. 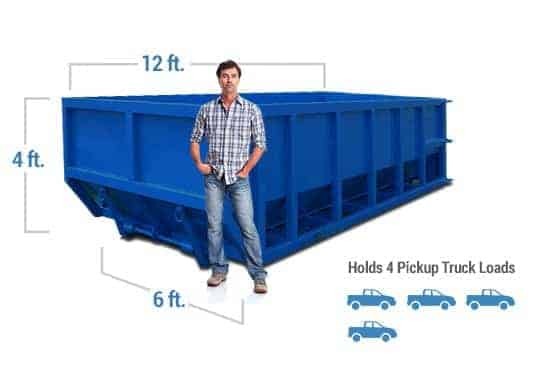 (12 feet long x 6 feet wide x 4 feet tall) Allows up to 2 tons of debris The 10 yard container is standard for small home improvement projects such as garage and attic clean outs and kitchen remodels. The bin can hold light demolition materials. The low height of the container allows for easy disposal. (20 feet long x 8 feet wide x 4 feet high) Allows up to 3 tons of debris Our 20 yard roll off is a great size for small scale demolitions. It is common for customers to use the bin for roofing and full room remodeling projects. With the 20 yard you can easily dispose of household and construction debris. (22 feet long x 8 feet wide x 6 feet high) Allows up to 4 tons of debris Smaller than the 40 yard, the 30 yard roll off is standard for customer with multiple or full home renovations. An acceptable size for large -scale cleanouts. I work with Discount Dumspters all around the city, they always deliver and pick up on time, I highly recommend them. You may have never thought of renting a roll off in Chicago before. We are here to let you know how simple the process can be. When you call us, our team will strive to make sure the right dumpster is chosen for you. After choosing your container, the team will get you set up for delivery, and you are all set to receive your dumpster. All you have to do is give us a call to rent a dumpster (or multiple) Monday through Friday. Need Multiple Dumpsters in Chicago? Rent for your Construction Needs Today! Whether you need one dumpster or 20, our team can welcome just about any size order. We have virtually no limits on quantity, so no job is too big or small. Different projects may call for different dumpster. One site may contain household waste and another may hold construction debris. This means some jobs may call for multiple bins. Call us today to see if we have the option for you. Our standard rental term is 10 days, which is something our competition can’t come close to achieving. If you need the roll off for less time than that, you can give us a call saying when you would like the bin picked up. We will come out as soon as possible. However, if you end up needing the container longer than 14 days, we can let you keep the dumpster as long as needed for $10 extra per day. Its that simple! When planning to rent a dumpster in Chicago be sure to know when you plan to place the container. For a simple step by step process on the process is included in the Chicago Department of Transportation Construction Dumpster Permit guideline. To avoid going through the permitting process it is suggested you place the container on your personal property. By utilizing gravel or your driveway you will be able to dispose of all debris in one place and forego the extra cost of a permit. The city of Chicago offers permits with two different durations. The first is the three day permit which is ideal for the weekend warrior or quick cleaning projects. If you will be needing the bin for more than 3 days a 30-day permit is required. Cost associated with the three day permit is $50.00. The cost for the 30 day permit is $100.00. Don’t worry about processing the permit though. We will take care of all the paperwork for you. How long will it take to get my dumpster rental delivered? At Discount Dumpster, we offer fast, reliable service so that you don’t have to wait to start working. Scheduling your dumpster rental in Chicago ahead of time ensures that your dumpster is on site when you need it. Our deliveries start at 6:00 a.m. and run until 6:00 p.m. for your convenience. You will receive a text message with your delivery and pickup times for your dumpster rental. What can’t go into a dumpster? How much space will my dumpster rental require? The amount of space you’ll need to accommodate your dumpster rental in Chicago depends on the size unit you require. A 10-yard dumpster measures 12 feet long x 6 feet wide x 4 feet tall and holds up to two tons of debris. These dumpsters are approximately the size of a parking space and hold about four pickup truck loads of debris.